Passion for design-thinking and systems-thinking approaches to bring people and technology closer, creating harmonious digital experiences, SaaS products, online communities and mobile applications. I can deliver on a career’s worth of communication and facilitation skills aiming to empower people and translate their needs and desires into successful business metrics. I’m lucky that most of my work has been less work, more continual learning and collaboration with businesses and social changemakers. Their support of user-centric processes has helped me to be comfortable navigating uncertainty as the how’s and why’s emerge. I value dharma over drama, and am equally comfortable interfacing with product owners, clients and development teams. Select below to see examples. Interested in hearing more about process? Reach out and let’s talk. 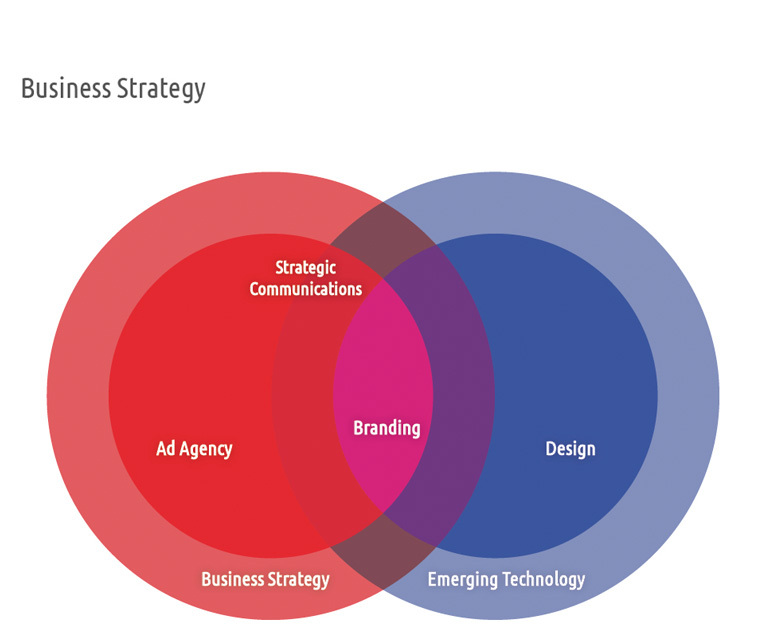 The Venn diagram shows how career decisions have led me to doing what I love: User Experience Design. Through the journey, I’ve had responsibilities ranging from supporting posts to leadership roles. Personally, I’m motivated by simple pleasures, complex challenges and strive for equanimity. Previous work in ad agencies, in-house communications and business ownership means I can deliver on business competencies. Metrics, budgets and timelines are part of my professional DNA. I earned my chops as a writer and researcher, studying consumer behavior to influence purchases and brand loyalty. Then fulfilled a longtime dream: diving deep into immersive User Experience training. 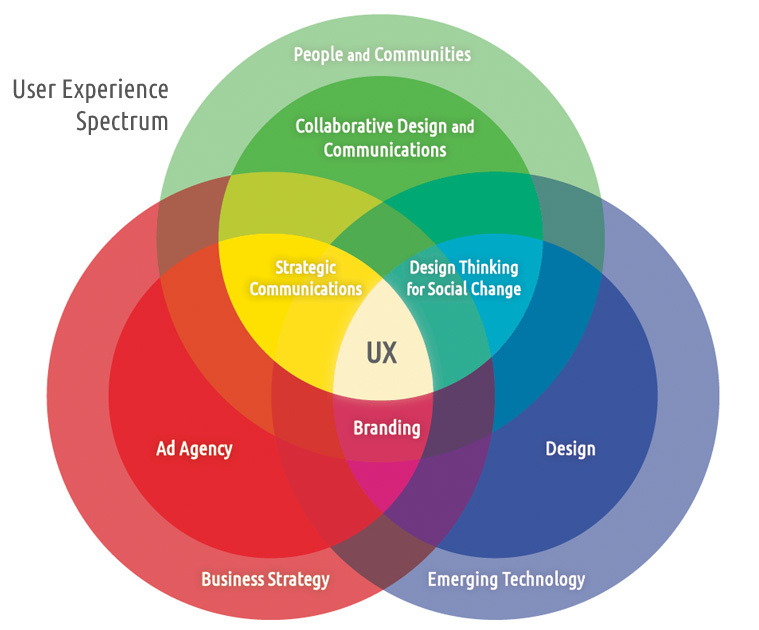 UX tools provide the insights and validation to better inform decisions. Informed decisions are better decisions, and make for more lasting ROI and meaningful experiences. 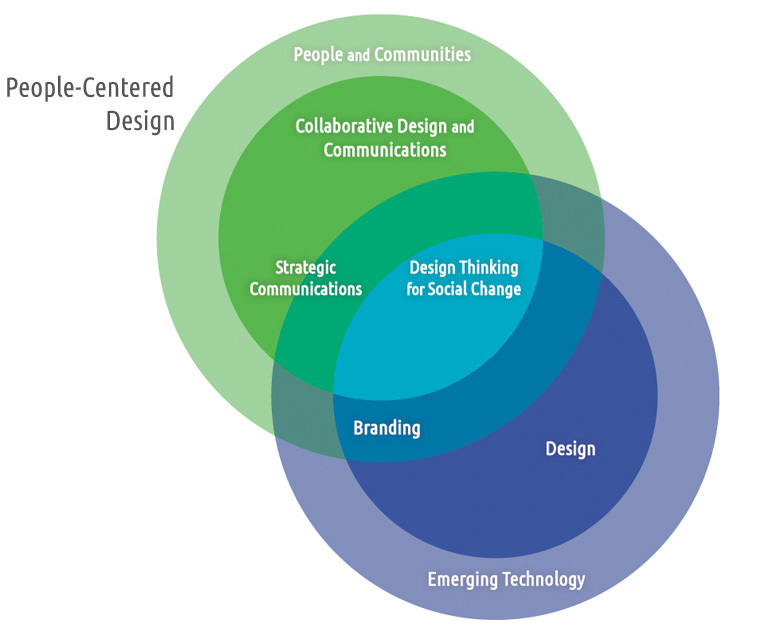 Working on cross-discipline teams in community development, I learned people-centric research methods and design thinking for social strategies. I got to build digital tools for scenario planning and websites to connect people, ideas and funding to solve complex challenges. These collaborative design experiences transformed my own mental model and shifted my focus from market-driven to people-centered strategies. I’m comfortable navigating through uncertain waters, and have developed skills to maintain strategic focus as insights from the how’s and why’s emerge. I can deliver on end-to end user experience drawing from a career that encircles UX-related disciplines. As long as I can recall, I’ve been intrigued about what makes people happy. I know. Happiness can't be made or manufactured, it has to come from within. But good experiences—those that remove frustrations, barriers and time-wasters—do make life easier, create better experiences and increase the overall happiness factor. Thomson Reuters, Nike, Sustainable Communities Action Town, JustChoice Lending and Wei Kitchen. Give Instagram users a simple way to share a physical printed versions of their digital memories. As Instagram’s first in-App product, there is high potential for risk and reward. Key factors: simplicity and an informative, but non-interruptive flow. 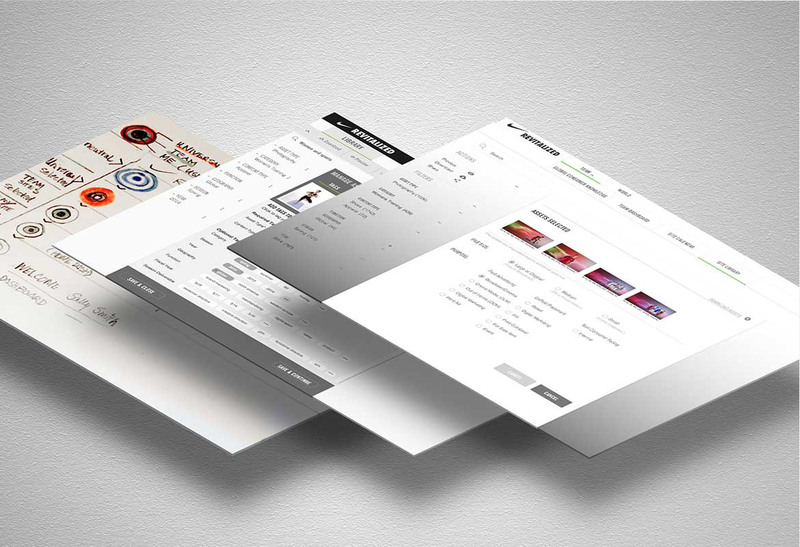 And enough added value for users to abandon printing patterns with more established services. Outcome: User trust and appreciated conveniences. User response to PrInstagram was very positive. Users trusted the feature implicitly because of Instagram name. They appreciated the convenience of an in-App flow, that didn’t disrupt photo posting. Merchandise that connects digital experiences with in real life ways to share those experiences were most popular with testers, especially the ability to snail mail a postcard from a digital photo. “Instagram Photo Printing App” was lost on users. 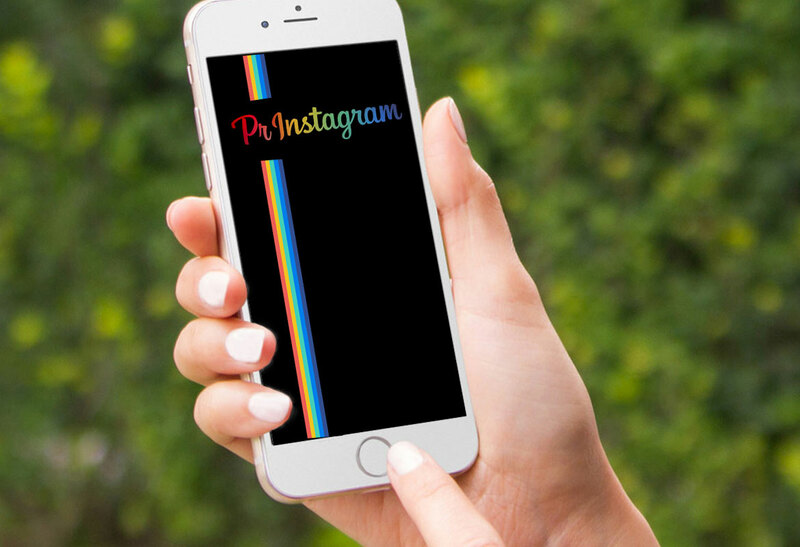 Introducing: PrInstagram. Persona and User scenario helped clarify how Instagram could best leverage opportunities in-App without disrupting user flow. Role: Teammates Mohammad Eloguez, Dave Lawson and I worked fluidly sharing research responsibilities and analysis; Mohammad took the lead in Sketch, Dave at the helm of Axure prototyping, while I focused on product strategy, Adobe design and Keynote presentation. Thanks to Nathan Maas, PrInstagram is being reborn as a web and mobile app. Proving that great minds not only think alike, they work better together, destiny brought together Nathan's Penny Post and the PrInstagram concept. A team of a half dozen merry devsters plus Nathan spearheading all PM tasks and my UX contributions, we aim to have an MVP ready in January 2016. Stay tuned for updates here. Recently purchased by Facebook for a $1 billion, quick profit has never been part of Instagram's DNA. In fact, founder Systrom has always avoided letting business strategy trump user experience. Constant Contact surveys proved valuable to screen and inquire about printed photograph and photo-sharing behavior. In-depth interviews led to affinity diagram honing in on barriers, sentiments and routine around printed photos and photo merchandise. 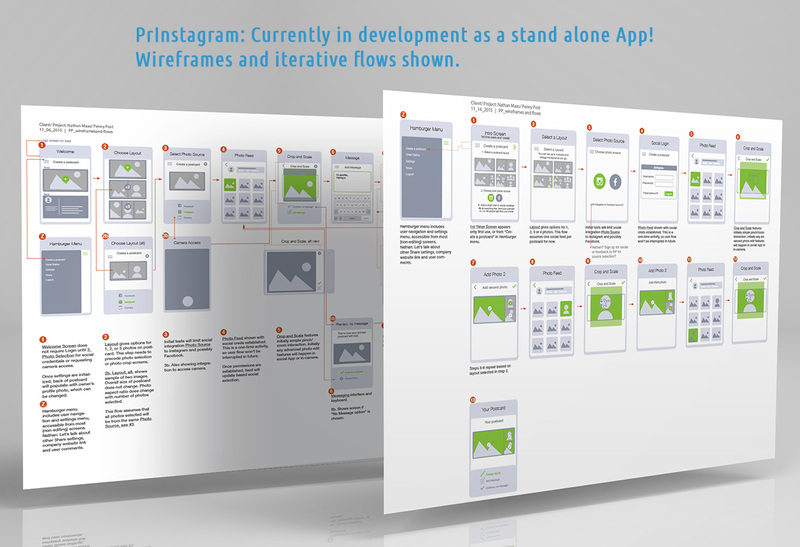 We began to clarify how Instagram could best leverage opportunities in-App without disrupting user flow. Instagram's philosophy, "not to let technology get in the way of user experience" served as the guide. 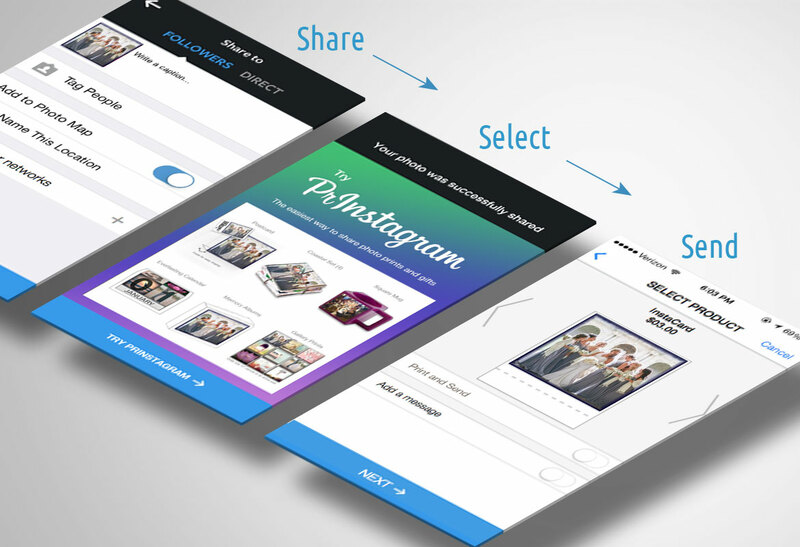 By introducing the print feature within the photo sharing interaction, the user determines with branch in their flow: either photo sharing, printing or both options are clear. Opportunity: Research, design and usability testing for the Nike Global Brand Digital Asset Planning tool. Revitalized (working name) replaced three over-extended disparate planing tools. Revitalized integrated existing features, while improving upon the decades-old systems. The proprietary site not only had to be responsive, but accessible to more than 44,000 global users on varied devices and digital connection speeds. 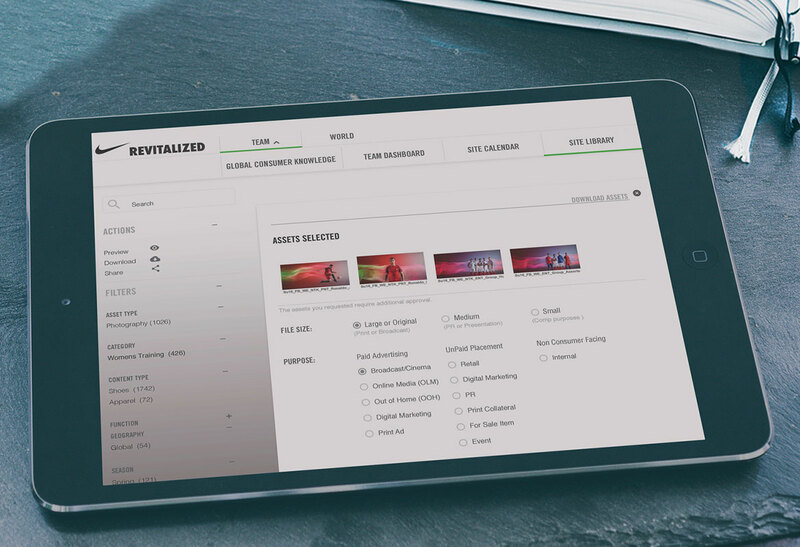 Outcome: Revitalized, NIKE’s Global Digital Asset Management and Brand Planning Tool. 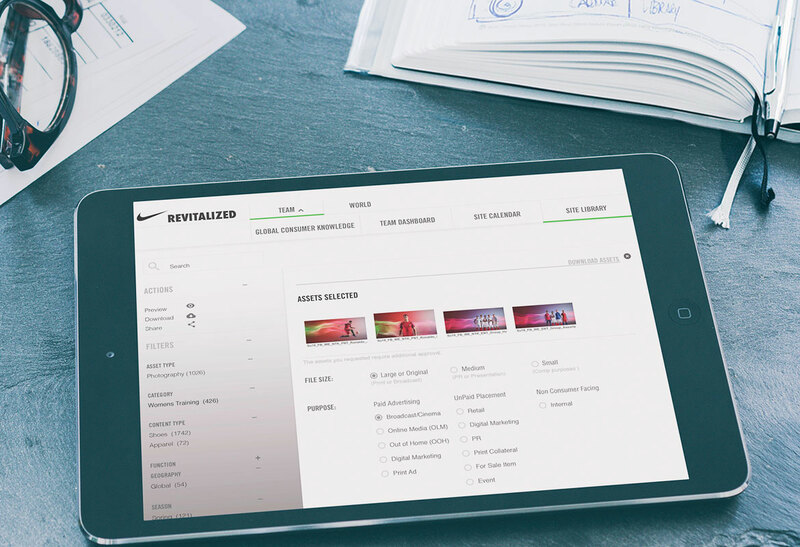 Revitalized had to simplify the complex task of managing Nike’s vast digital assets, including a user-upload interface to manage asset tagging and right management. I was tasked with developing the design system and corresponding Revitalized Style Guide (adhering to Nike corporate design standards), including widget-level redlining, responsive-grid specifications, interactive prototyping and liaising with developers. Led design studio activities with internal stakeholders to streamline site navigation into testable prototypes. Role: On a three-member UX/ UI team for a new Global Brand Marketing digital asset and brand planning management system. Led design studio activities and Style Guide development. Our team of three supported discovery and research activities, SME interviews and usability testing. Design studio activities helped crystalize the user experience guiding Nike staff in uploading, tagging and right-managing Nike’s most valuable and confidential products—its digital assets. 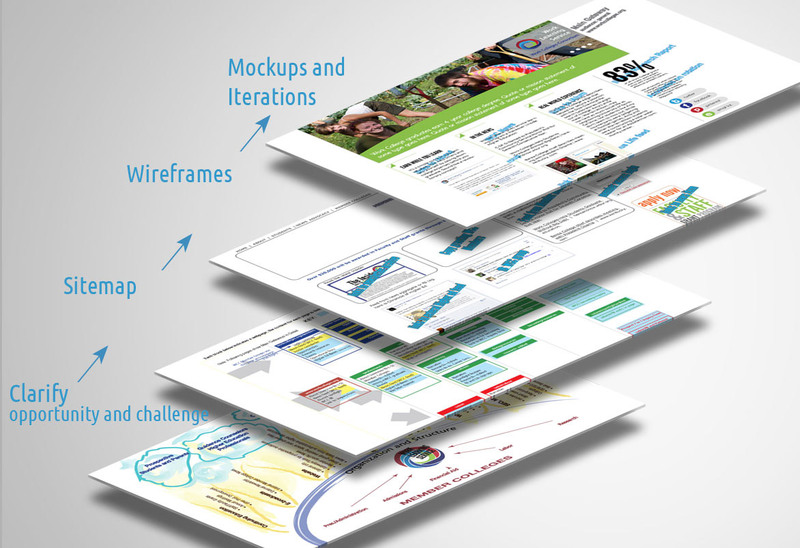 My role focused on translating usability findings into interactive wires and fluid grid design templates, creating custom asset libraries (Axure and Illustrator), Style Guide and responsive grid, and interfacing with dev team. Opportunity: Elemental cooking. Easy as 1, 2, 3. Our team was invited to help make Asian cooking more approachable and enjoyed by more people. Wei Kitchen's infused oil and vinegar products are great flavor enhancers/time savers. They needed a clear, concise way to convey that via their website. 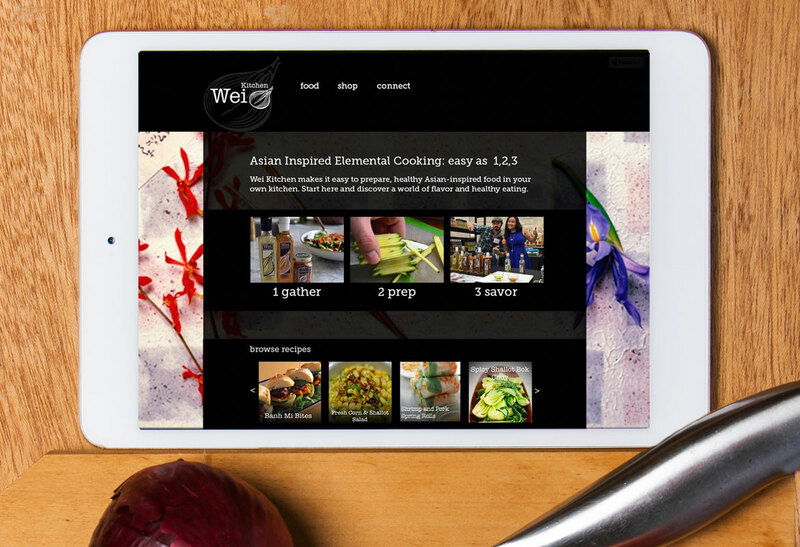 Outcome: A well-curated, lifestyle-focused, interactive website that showcases Wei Kitchen infused oils and vinegars. Echoing user’s desire for informative steps, but “make it look easy”, every meal is simplified into 3 steps: Gather, Prep and Savor. 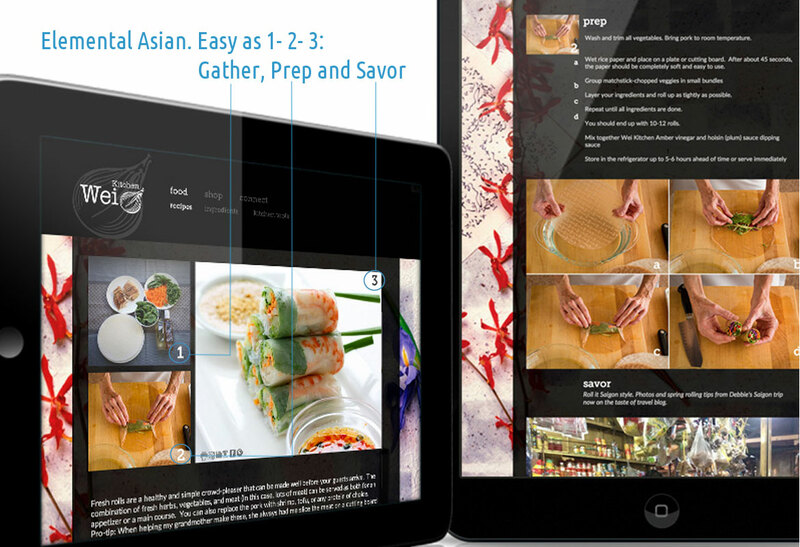 This matrix informed everything from site navigation to recipe categories. The end-to end UX project became stronger with each iteration and usability test. We orchestrated a final website that delivers on validated, user-driven desires that dovetail with the business needs and measurable metrics for the client. Love it when a (well-informed by users, client-supported) plan comes together! 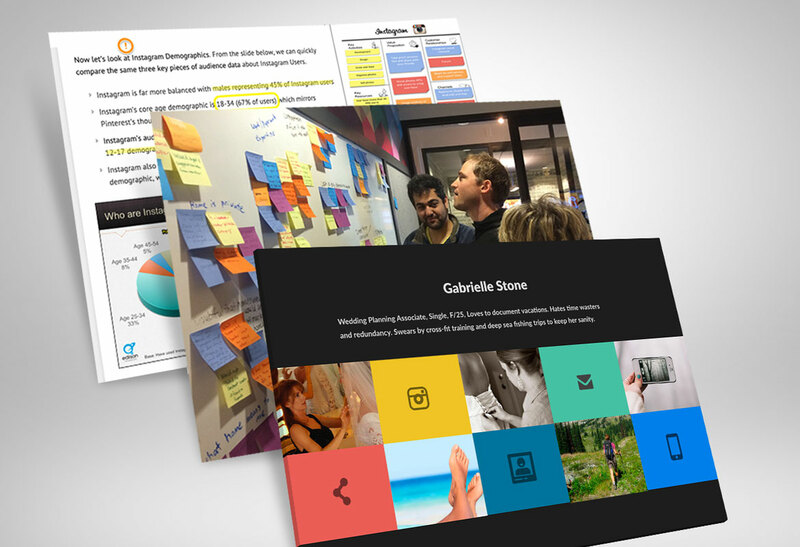 Role: I led strategy, prototyping and design aspects, supported by Aja Petee; she led persona crafting and client interfacing; Rick Hauptmann led the research recruitment and remote testing. We collaborated on analysis and other following activities: Organizational research, Domain research, Research on Cooking Motivations (primary and secondary), Heuristics analysis, Screening and Detailed User survey, User test consent and plans, In-depth user interviews, Affinity mapping, Concept mapping, User personas, Design studios, Sitemaps, User flows, Wireframes, Multiple iterations working with Adobe smart objects, Lo-fo|Hi-fi Prototyping in Axure. Wei Kitchen’s products are ‘first to market’, certified organic and of exceptional quality. The products are sold throughout West Coast retail grocers, so consumers need a reason to go to the website. 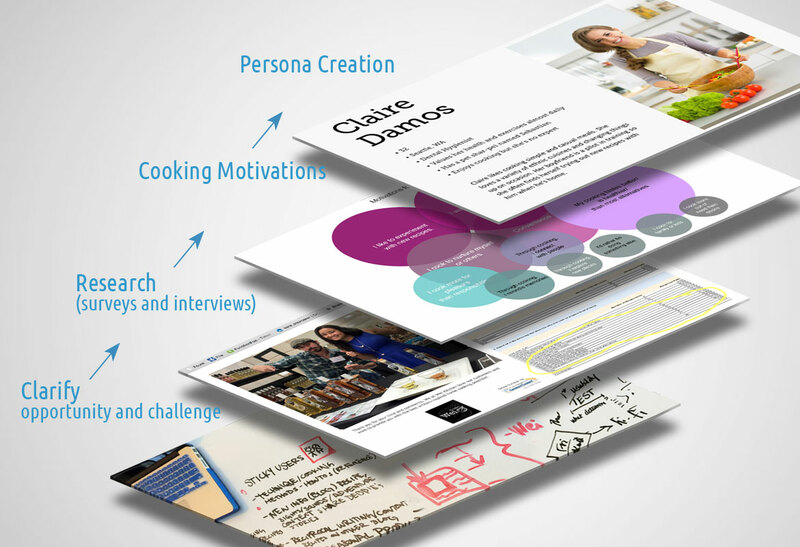 Domain research focused on ‘cooking styles and motivations’ which gave valuable insight to both recipe/meal selection and entry point for client’s product. In-person, task-based usability tests followed up by exit interviews to help gauge baseline time-on-site, navigational flow and ‘sticky’ concepts or impressions post visit. Hours of transcribed discussions (about people’s cooking habits, recipe searches, ideal cooking scenarios, favorite resources and cook’s desires) helped us to better understand the the customer journey of planning, shopping, prepping, cooking, serving, eating. With user preferences clear, we did a series of activities to first think big (generate, create, ideate), then synthesize (refine, winnow, prioritize). Flows addressed where (to recipes) and what (clarify purpose of the site) and how (simple steps and options) to fully deliver on user desires. Once distilled, the user’s desire for easy as 1,2,3 gave clear organizational structure to the site and the only 3 steps to any meal: Gather, Prep, Savor. Wei Kitchen has begun an excellent job of curating quality content. But it was lost on users going to retrieve a recipe and exiting. Aiming to cross-populate content, we tested several dynamic search/select tools that would work across multiple platforms. Site hints of coming features like a Taste of Travel Blog and Asian Cook Technique and Tips were well received. Although out of scope for this UX project, we designed a bottle hang tag to help direct grocer point-of-sale consumers to the Wei Kitchen website. Create print and digital assets compelling enough to secure college scholarship funding for tens of thousands of students with great promise, but little financial resources. In the six year relationship with Work Colleges, I’ve helped the organization secure millions extend its value by communicating complex data to key influential audiences, clearly and succinctly. 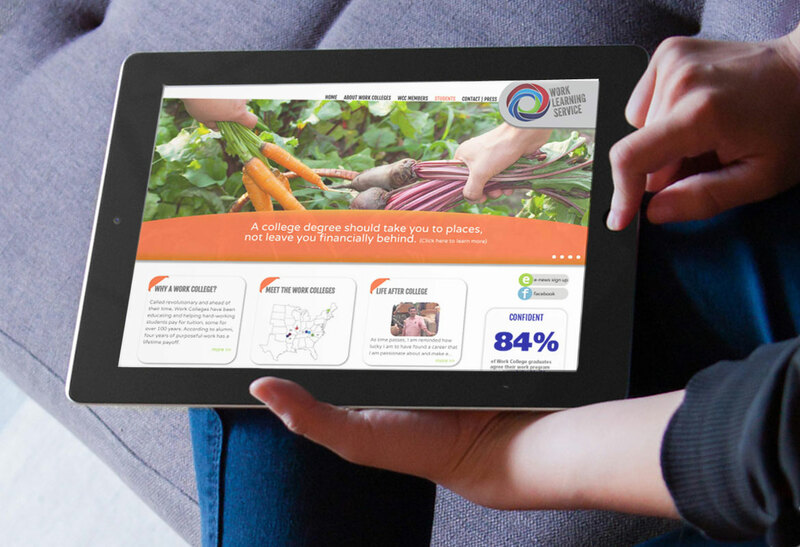 Working with the Consortium’s two very dedicated staff, I developed and implemented a multi-year communication strategy, including comprehensive print and web assets. Efforts resulted in $6.5 million to advance its distinctive Work-Learning-Service approach to making college for accessible and affordable. Work Colleges help students graduate with a valuable liberal arts degree, four years’ work experience and little or no debt. It’s model that’s proven successful for more than 150 years. Currently there are seven federally-designated Work Colleges across the country. All students must participate in the comprehensive Work-Learning-Service program. 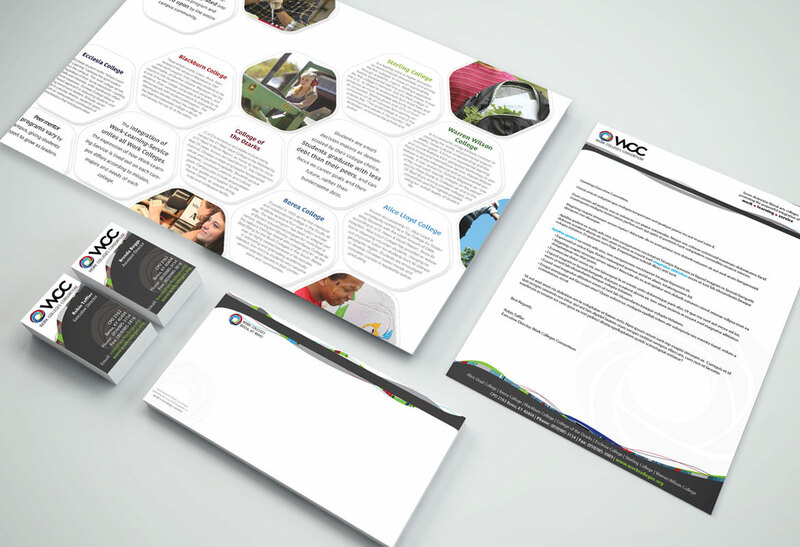 The WCC plays a crucial role: networking the seven Work Colleges and liaising with the U.S. Department of Education and Congressional delegations. It’s messaging and materials have to be clear, direct and highly informative. And condense hundreds of pages of student assessments and outcomes into a 2-minute read. Shown are some of the communications pieces including a Drupal CMS site that allows Member Colleges to collaborate and share resources. Plans are underway for student-created web journals, YouTube student videos, and other storytelling tools to share their learning-labor-service experience. 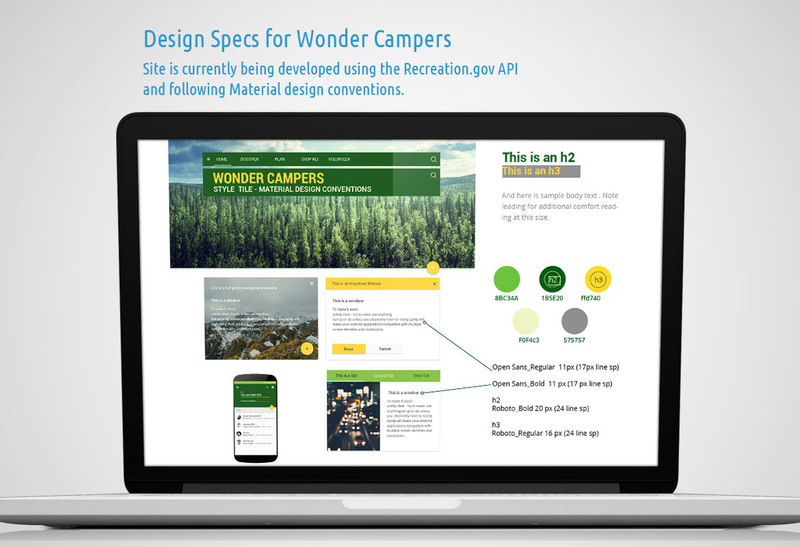 Outcome: Update: WonderCampers development is underway using Angular| Material and the US.gov API. Much thanks to Dave Hemmer. 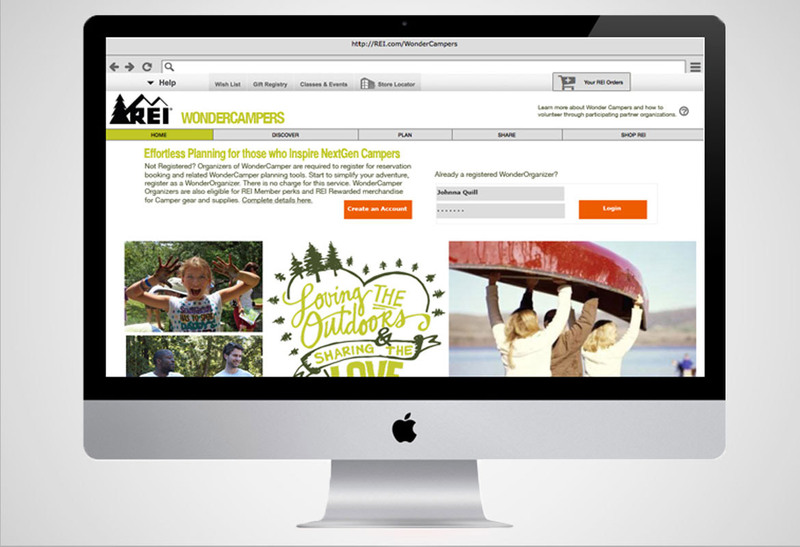 Wonder Campers is a REI micro-site supporting the thousands of volunteers who plan camping and outdoor events for inner city youth. The site includes planning tools to Discover, Book, Plan and Share adventures. The concept also extends REI’s successful loyalty program, allowing Members to ‘donate’ their REI dividends toward gear and supplies for aspiring campers in need. Role: This was a solo concept project. I provided end-to-end UX services: Research, Comparative/competitive analysis, Heuristic analysis, Screening and User survey, User test consent, plans, In-depth user interviews, Affinity mapping, Concept mapping, User persona, User flows, Storyboards, Sitemap, Scenarios, Wireframes and wireflows, Prototyping and Remote usability testing. UX research methods and tools revealed a clear direction. Campers overall are prepared people and have already-established, more effective means to self-organize. Other challenges were revealed in research: responsibility for others’ kids including allergies, emergencies, permission slips and gear/equipment preparedness. 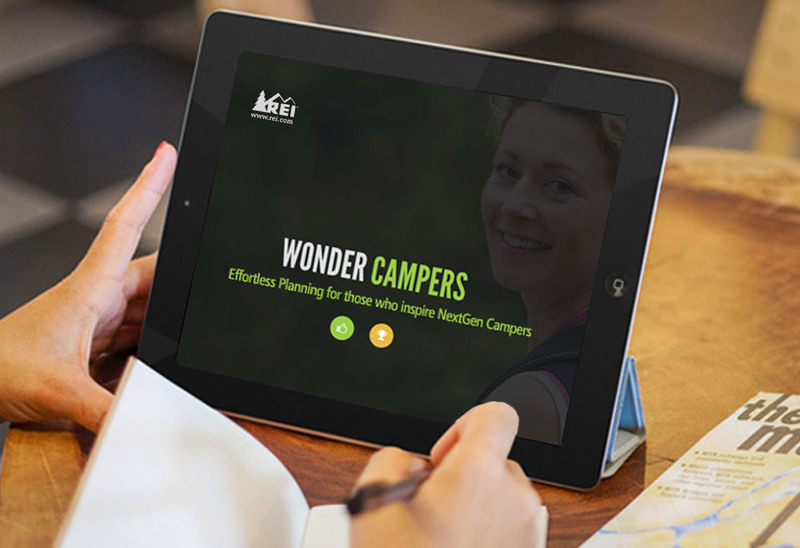 This gave me the opportunity to pivot and reimagine a microsite that could address needs of a growing and promising audience: camp volunteers for Sierra Club, Big Brothers and other groups. In addition to purchase activities, the site includes a CMS integration allowing volunteers to coordinate with guardians for permission slips, emergency contacts and more: Tents? Boots? And manage communication with a dozen parents, many who have never camped. The early introduction to REI should contribute to loyalty among youth campers and extend its ‘purpose brand’ even deeper into the hearts of its affinity groups. 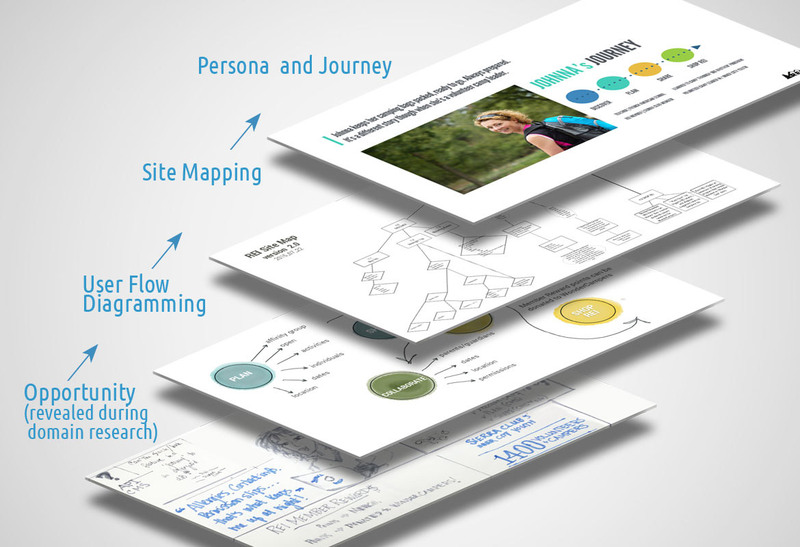 Techniques like concept mapping, card sort, storyboarding, user scenarios and contextual inquiry informed better sitemaps and tighter prototypes. Since this was a solo project, I developed a ‘checkpoints poster’ for both inspiration and to stay focused on the user perspective. In-person testing led to further prototype edits. 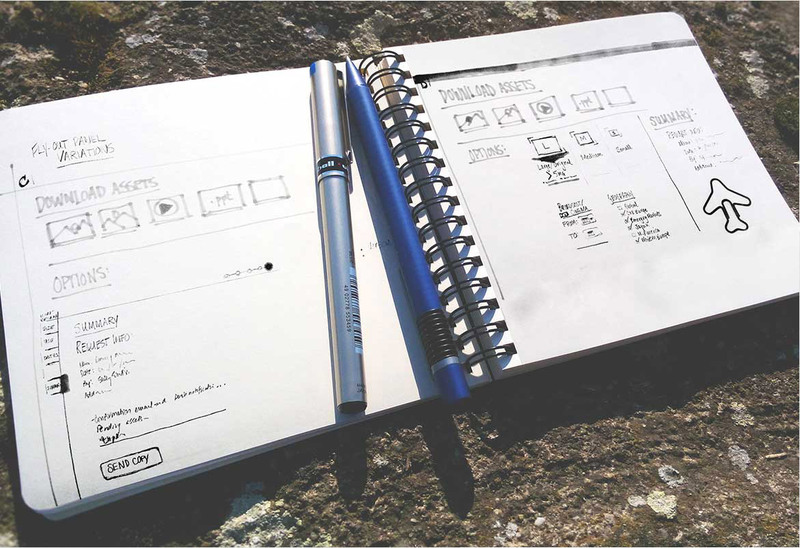 Balsamiq was appropriate for low fidelity prototyping and rapid iterations. Berea College’s reputation was much stronger than its visual identity; in 150 years, it didn’t have a logo or consistent brand assets. I led the campus collaborative design process for all related College properties including print, web, retail and wayfinding. 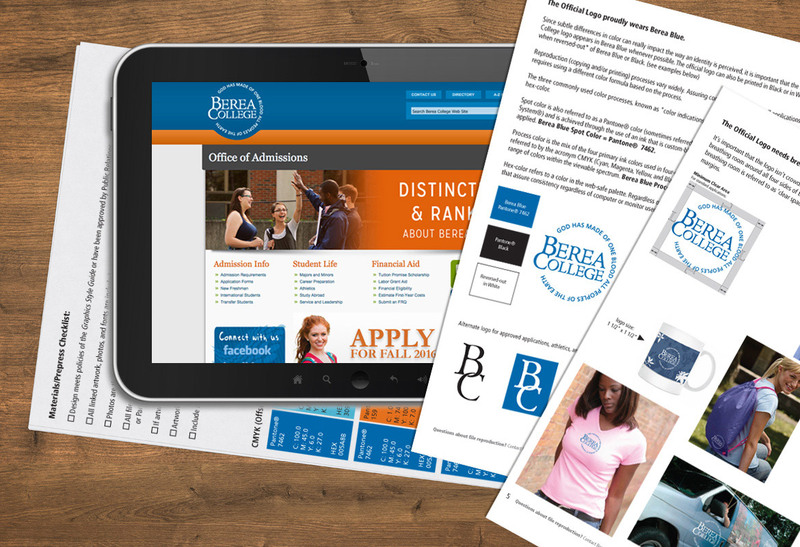 Outcome: An authentic brand and identity for Berea College, a nationally top-ranked liberal arts college. Campus-wide buy in from faculty, staff, administration and students. Working with Berea's stellar PR department, we built the foundation for a cohesive brand across all College assets including two for profit enterprises a successful $150 million Capital Campaign, and commitment to green renovations and focus on environmental responsibility. Role: Prior to formal UX training, I led a small-but-mighty creative team (5 people for more than 3 dozen active clients), Flying High Design. 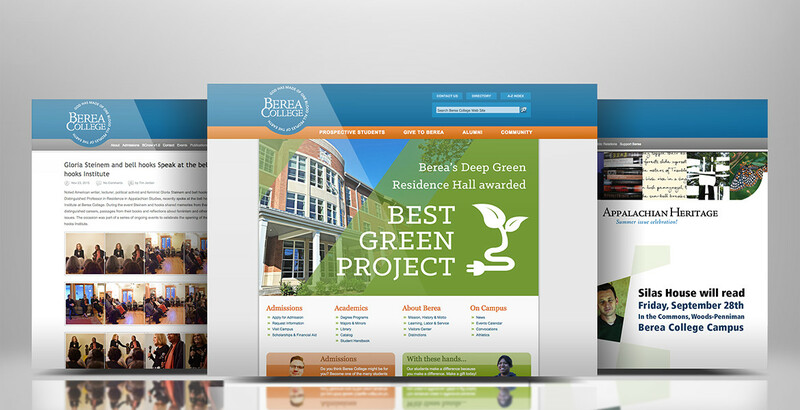 For Berea College's identity redesign and collaborative implementation across campus, I was responsible for the following services: Comparative analysis, Heuristic analysis, Stakeholder and User research, Affinity mapping, Pattern language evaluation, A/B testing, Design and implementation of Brand/style guidelines. Berea College was founded pre-Civil War and actively recruited women and blacks offering free education and skills training. Today, all Berea College students work on campus in addition to their studies. The arrangement also incorporates service activities, and helps students graduate with little or no debt. Berea College is regularly recognized by Princeton’s Review, U.S. News and World Report, and Forbes as one of the leading higher educational institutions in the U.S. In absence of an official logo, there were actually dozens (and dozens) of varying college signs and symbols. Many documents included the school’s official seal, dated and including a large crucifix, the seal was not appropriate for this inclusive and liberal learning institution.I was invited to lead the collaborative design process, which included interfacing with the College's President, Administration, PR and a wide array of students and other stakeholders. The challenge was much larger than the actual logo redesign. The brand-development process needed to be approached as a collaborative design process involving stakeholders across campus administration and the student body. It also had to lay the foundation for a 150-year celebration and capital campaign. 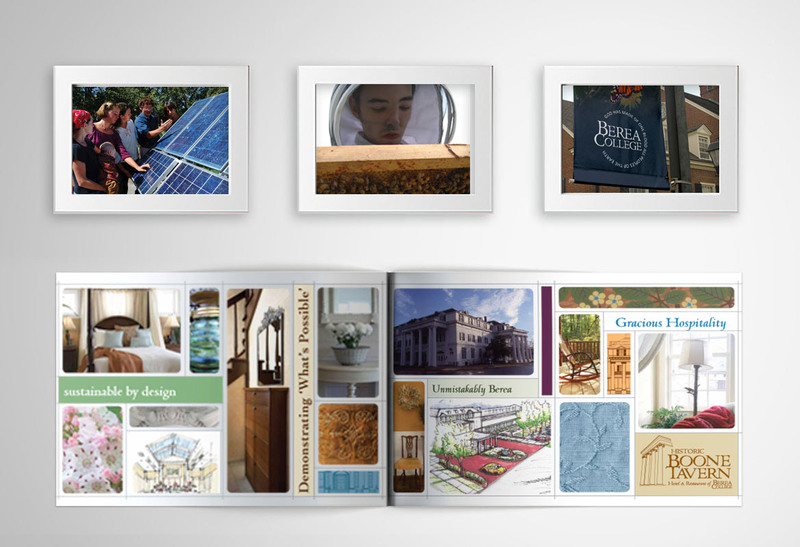 And include a family of style guides that adapted the brand assets to two related for-profit entities-- a historic hotel and Berea College established craft enterprises with retail and online presence. My team and I gathered existing assets, then facilitated design-driven inquiries to understand values and the authenticity the brand needed to convey. We conducted workshops and tested no fewer than five design treatments throughout College communications, donor development and the student body. The final result clearly expresses the College’s mission and ‘openness’. Implement vision and develop brand for one of the country's first socially-responsible lenders. 4 states, 60 lenders, and 4 integrated Drupal websites to manage Federally-compliant lending requirements. 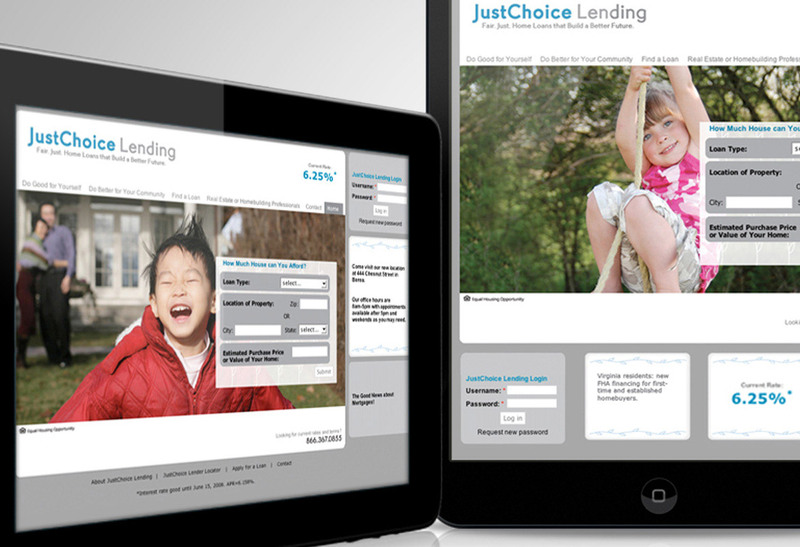 Developed the identity and integrated websites to launch one of the nation's first socially responsible lenders. Overcame challenges to develop the technical infrastructure in a complex and highly regulated industry. Reached target goals and success indicators six months early. Nationally recognized for performance and as an exemplary social lender by NeighborWorks® America. 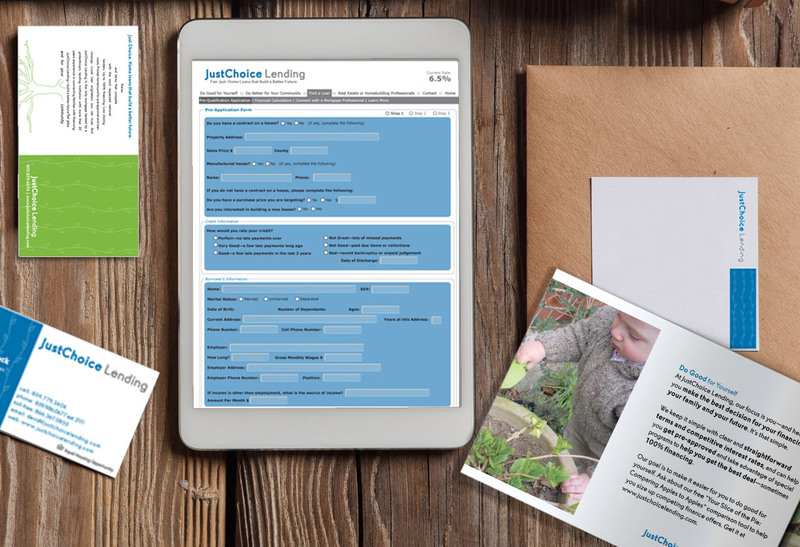 Launched JustChoice Lending (four integrated Drupal CMS websites and > 30 brick and mortar locations.) Research included responses to values statements regarding socially responsible products as well as detailed usability testing. Led team that tested and developed all brand assets, including a commercial lending website to launch mortgage products. Role: Prior to formal UX training, I led a small-but-mighty creative team (5 people for more than 3 dozen active clients), Flying High Design. 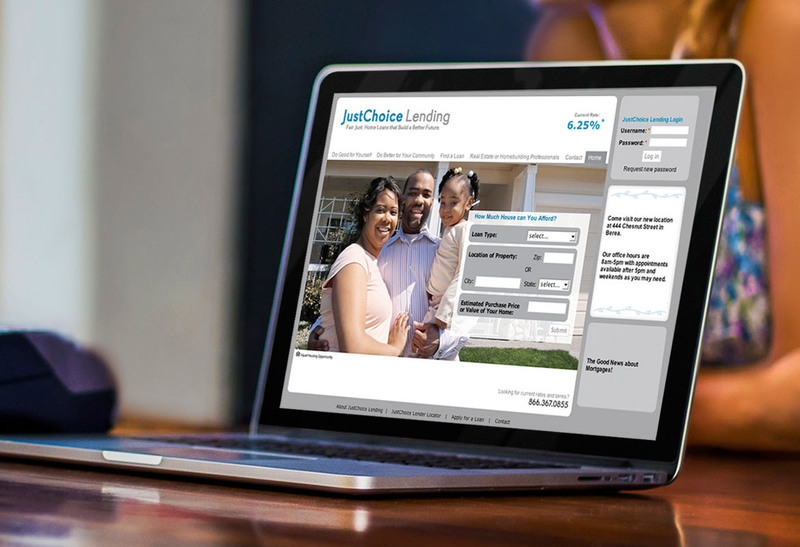 When a client introduced the concept of a mortgage that allowed reinvestment in affordable housing my team jumped at the chance to craft the identity and website for this emerging socially responsible lender. I was responsible for the following services: Discovery, Comparative/competitive analysis, In-depth interviews, User flows, Sitemaps and Wireframes for a multi-gateway Drupal CMS and a communications/collaboration network. F.A.H.E. is a mission-based, member-driven network spanning 4 states, with community-based members that employ more than 1,000 full-time workers, and contribute millions of dollars to local economies throughout Appalachia. In the past 27 years the network has helped more than 45,000 families secure a safe, decent home they can afford. The Federation of Appalachian Housing Enterprises (F.A.H.E. ), envisioned a loan product that would provide homebuyers with a low risk mortgage at market comparable rates. Rather than the profit or loan points going to a bank, the profits are re-invested to help fund low-income and affordable housing in their community. FAHE not only had to develop the mortgage product itself, but had to set up the system to allow all 60 organizations in five states represent and market the loan. FAHE members were well-versed in putting mortgage packages together, but this venture would require much more. FAHE had never aimed for market recognition, and this venture would require reaching out to an entirely new audience--spread across four states. What’s more all business decisions were driven by and had to support the nonprofit’s mission. FAHE’s Marketing Director and I worked with the organization's president that branding and online access would be instrumental for the socially responsible business to succeed. What started as a modest $2,000 print ad budget soon became brand development, an employee training program and a website platform that enabled the organization to attract more than $250,000 dollars in foundation and grant awards. 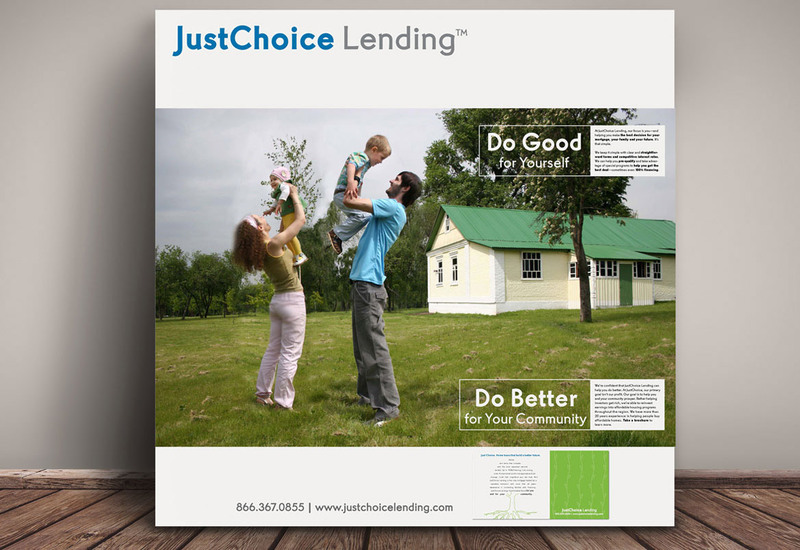 national foundation recognition and into into a we Developed brand identity and marketing strategy to launch one of the nation’s first socially responsible mortgages offered commercially by a nonprofit association of 60 member organizations.